Elite Concept– Designed for Competition; Engineered for the Win! Advanced Bassinator Elite Classic baitcaster reels deliver Pro Level performance for anglers like MLF tournament Pro, Bassmaster Elite AOY Brent Chapman. The Bassinator Classic casting reel was developed in a series of tournament ready fishing reels for peak bass fishing performance. “Elite” on a KastKing fishing reel tells you they’ll withstand thousands of casts a day in tough conditions. Palm Perfect Compact Design – The Bassinator Elite competition baitcast reel is KastKing’s smallest zero-flex aluminum frame casting reel that fits perfectly and comfortably in the palm of your hand. Bassinator Elite is a compact, Palm Perfect cast reel that is ergonomically designed for comfort with easy to open weight-reducing smooth carbon fiber Swing Wing side plates that stay in place when you open them so your side cover will never fall in the water or blow away if dropped. Tournament Proven Components – Bassinator Elite baitcasting reels are tested by bass fishing pros and are ready for your next fishing tournament with high-end components and features. Bassinator has a hardened aluminum main gear and solid brass pinion gear for durability and smoothness, short main shaft for weight reduction, higher speeds, longer casts without noise, a line memory dial function that lets you know what lb test line you have spooled up, and drainage ports that reduce maintenance. Ultra-smooth & Reliable – Bassinator Elite Classic uses 10 double-shielded, stainless-steel bearings including two, free-spin super speed spool bearings that provide you with amazing ultra-smooth performance and extra-long casts plus an instant stop anti-reverse bearing for a total of 10+1 BB. The spool tensioning nut has click adjustments for accurate control and it won’t back off during use. You can fish like a pro all day long with Bassinator baitcasting reels. Power and Control – The KastKing Bassinator Elite Classic baitcaster reel features a powerful carbon fiber drag that delivers up to 17.6 lbs of fish stopping power. A centrifugal cast control system features 6 adjustable braking shoes to eliminate backlash and overruns with a variety of baits in all fishing conditions. The Bassinator Classic Elite fishing reel series comes in a standard 6.6:1 gear ratio or a high-speed retrieve 8.1:1 model cranked with a carbon fiber handle and AAA cork grip. Fish like a pro!! 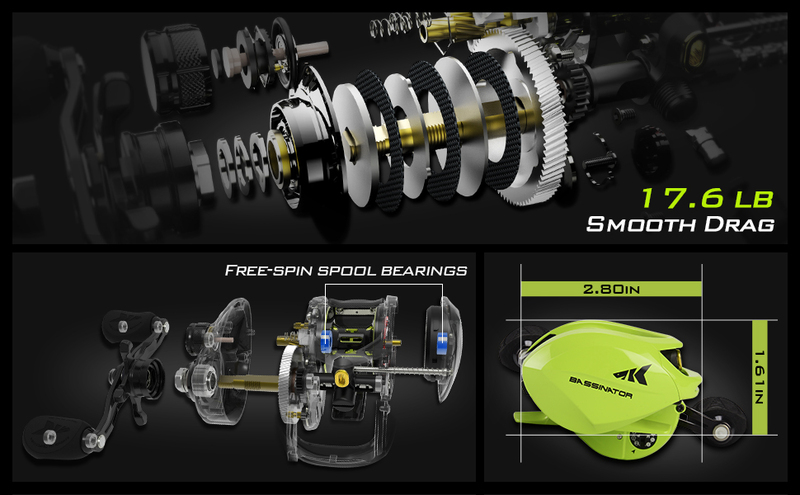 The amazing new Bassinator Elite tournament class baitcasting reels are the most compact, lightest, yet full featured, tournament-ready fishing reel that KastKing has made. Bassinator Elite zero-flex aluminum frame baitcaster reels are one fishing reel in a series of incredible new “Elite” pro tournament performance reels from KastKing. The Palm Perfect compact design fits easily into your hand for all day fishing comfort. Bassinator Elite fishing reels begin with a light yet tough, durable, aluminum frame with high end carbon side covers for additional weight reduction. The use of a hardened aluminum main gear and main shaft keeps weight to a minimum but are specially heat treated to increase strength and durability. KastKing used outstanding materials for handles and grips. These might just be the most comfortable grips you’ve ever used! Bassinator Elite low-profile cast reels use outstanding quality, double shielded, stainless-steel ball bearings (10+1), including two free-spin super speed bearings on either side of its CNC aluminum spool. These exceptional bearings greatly reduce noise and increase performance for farther casting distance. Powerful carbon disc drag washers eliminate frustrating and erratic drag tension delivering a smooth maximum drag power of 17.6 lbs. The Swing-Wing style side cover opens easily and swings out and away for access to the spool. It stays attached to the frame and will never be lost. Bassinator Elite baitcasting reels are super easy to cast! The centrifugal braking system is easily accessible and features 6 adjustable braking shoes to virtually eliminate overruns and backlashes with baits of any size in all conditions. 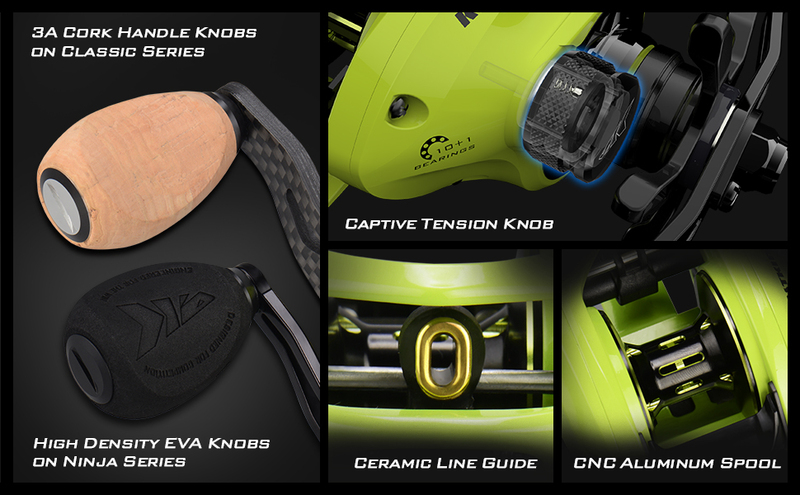 The aluminum tension control knob has click adjustments and won’t back off during use. The Bassinator Elite Classic casting reel comes in right and left-hand retrieve models and versatile gear ratio that you will want to use.